Taking place on 1st-3rd March the event will provide a professional road cycling experience to an international field of over 250 amateur cyclists. Riders have the opportunity to explore the unparalleled beauty and hospitality of the Sultanate with the extreme challenge of high-altitude mountain riding. With entry closing soon, cyclists around the world are racing to sign up for the Middle East’s first-ever Haute Route event. Former F1 champion and Leger co-founder, Jenson Button will also be riding Haute Route Oman as the official event ambassador. “I can’t wait to take part in Haute Route Oman on what will be my second visit to the country,” he said. “I’m thrilled to be returning to ride what looks like a challenging but stunning course. It will be great to share the experience with Omani cyclists, as well as those from the Gulf region and riders from all over the world,” he added. Designed to highlight Oman’s natural beauty, the three-stage course will take cyclists 238kms with 5,500+ metres of climbing through the Hajar mountain range, on routes that will test stamina and skill with long, high-altitude, climbs and sweeping descents.Stage one begins at the Golden tulip – the top of Jebel Akhdar climb, (83.27Km, 3000M+) followed by stage two: Golden tulip – Al Hamra climb – Golden Tulip, (145.3KM & 2,300M+) and then stage three: Al Hamra – Misfat al Abriyyin, (9.3KM, 350M+). In addition to riding the same roads registered riders will be treated like the professionals too, with expert rider services including motorcycle escorts, live timing, professional photography and post-stage meals. Participants will also be treated to a free set of bespoke Haute Route Omancycling jersey and bib shorts, courtesy of the event’s official clothing brand, Léger. 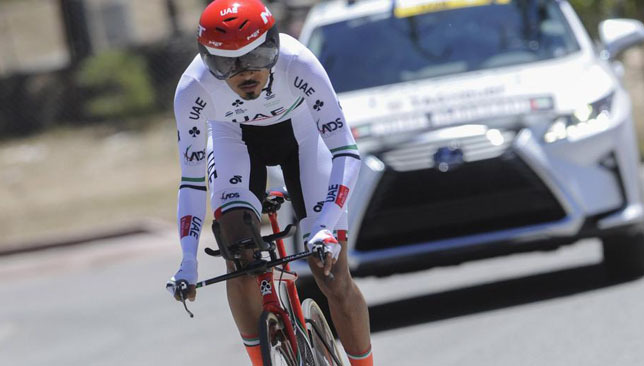 Emirati all-rounder Yousif Mirza heads to Europe with 11 of his team-mates in their first set of races for the 2019 season, as UAE Team Emirates take on Challenge Mallorca, a four day competition from January 31 to February 3. Four seven-man teams will be guided by sports director Marco Marzano and technical assistant Paolo Tiralongo across four different one-day races. 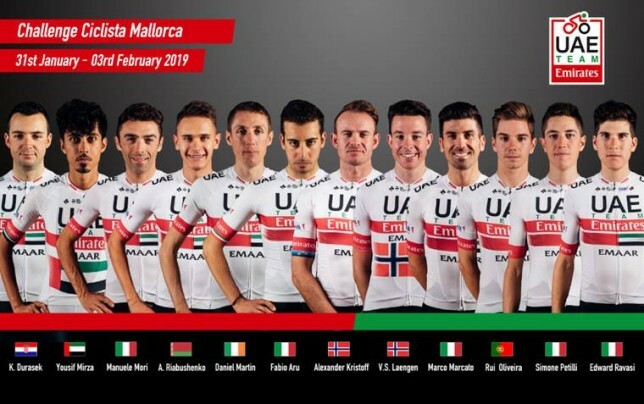 The team for the Trofeo Ses Salines, Campos, Porreres, Felanitx on January 31 includes: Fabio Aru, Manuele Mori, Marco Marcato (all Italy), Alexander Kristoff, Vegard Stake Laengen (both Norway), Yousif Mirza (UAE) and Rui Oliveira (Portugal). Riders competing at the Trofeo Andratx Loseta on February 1 are: Kristian Durasek (Croatia), Kristoff, Stake Laengen, Dan Martin (Ireland), Simone Petilli, Edward Ravasi (both Italy) and Aleksandr Riabushenko (Belarus). The team for Trofeo de Tramuntana on February 2 is: Aru, Durasek, Martin, Mirza, Petilli, Ravasi and Riabushenko. Finally the Trofeo Palma contingent on February 3 is: Durasek, Kristoff, Stake Laengen, Marcato, Mori and Oliveira. Mirza said: “I can’t wait for this new season to begin. This will be year three of the amazing adventure of UAE Team Emirates, we improved a lot and we want to achieve better results. “In the early races, my team-mates were very good in terms of results. My path in WorldTour cycling has been so exciting up to now, I’m becoming a better rider day after day thanks to the huge skills of the team’s management, staff and directors. “The Challenge Mallorca takes a certain importance given that we have 12 riders heading there,” said Marzano. “Our objective is not just results, but to use the four days of racing to better understand how our winter training programme has improved the riders’ form. 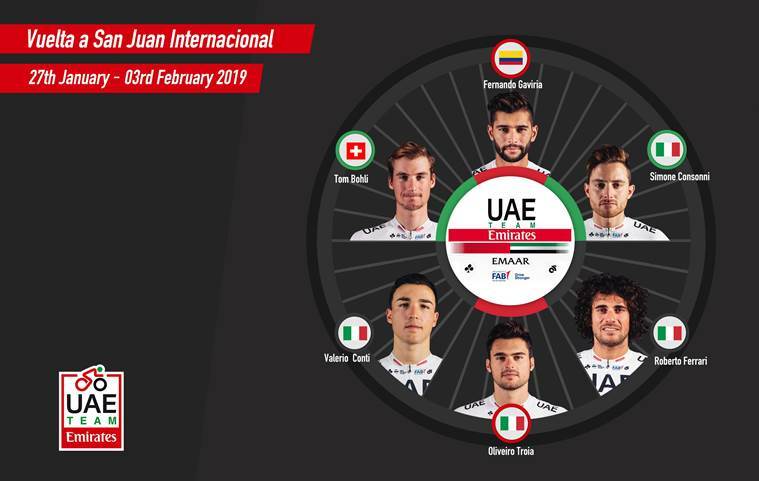 Gaviria will be one of a host of star names taking part in the inaugural UAE Tour which starts on February 24. 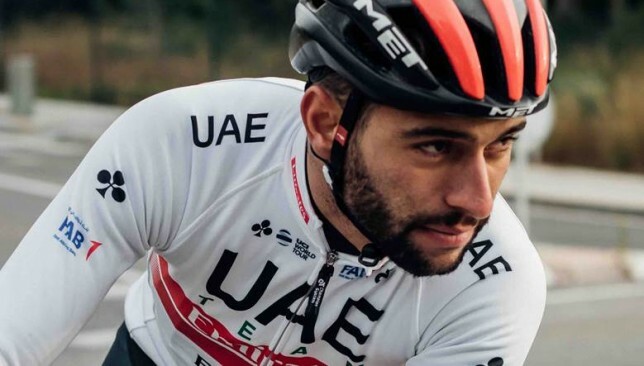 Fernando Gaviria, who made headlines during the 2018 Tour de France for his two emphatic stage wins, will pull on the UAE Team Emirates jersey for the first time this Sunday as he gets his 2019 season under way at the Vuelta a San Juan. The rising Columbian sprint superstar will be supported by an Italian quartet of riders including Simone Consonni, Valerio Conti, Oliveiro Troia and the highly experienced Roberto Ferrari in Argentina. The six-man team will be completed by another new signing, the promising young Swiss talent Tom Bohli. The seven stage race begins on Sunday with a 159.1km out-and-back route from San Juan to Pocito. The flat stage only features two small climbs – over the Alto de las Vacas – and culminates with a slightly downhill run in to the finish line, perfectly setting the scene for an exciting bunch sprint on the first day of racing. Gaviria said: “I return to Argentina and San Juan with gusto. I have great memories with my victories, although last year I had to quit after falling. Stage 2 from Chimbas to Punta Negra will be a test for the legs. The 160.2km route takes the peloton up and over the 960m high Alto Punta Negra four times during the day, before ascending the Peri Lago Punta Negra climb for a gruelling summit finish 1,000m above sea level. Stage 3 is one for the specialists, a short and straight 12km Individual Time Trial (ITT) over a pan flat course in the town of Pocito. Stage 4 features the first big mountain of the tour, halfway along the 185.8km route from San Jose Jachal to Valle Fertill. The peloton will ascend one category three and two category one climbs as they make their way to the summit 1,510m above sea level. The remainder of the race is a downhill charge to the line – with over 80km of near-constant descending. Stage 5 features another summit finish atop the iconic Alto Colorado, standing 2,565m above sea level. Before the peloton reaches its destination it will have to ascend one category three and two category two climbs on a punishing route that involves well over 2,200m of climbing. Stage 6 will be a welcome sight for the sprinters after two days in the mountains. The 153.5km route is all but flat, starting and finishing in the Autodromo Villicum where the fast men will battle for the sprint points title. The peloton returns to San Juan for the seventh and final stage; a nine lap, 141.3km criterium in the centre of town that will provide fans with an exciting and action packed spectacle to end the tour. The team will be guided through the Vuelta a San Juan by Swiss sports director Simone Pedrazzini.